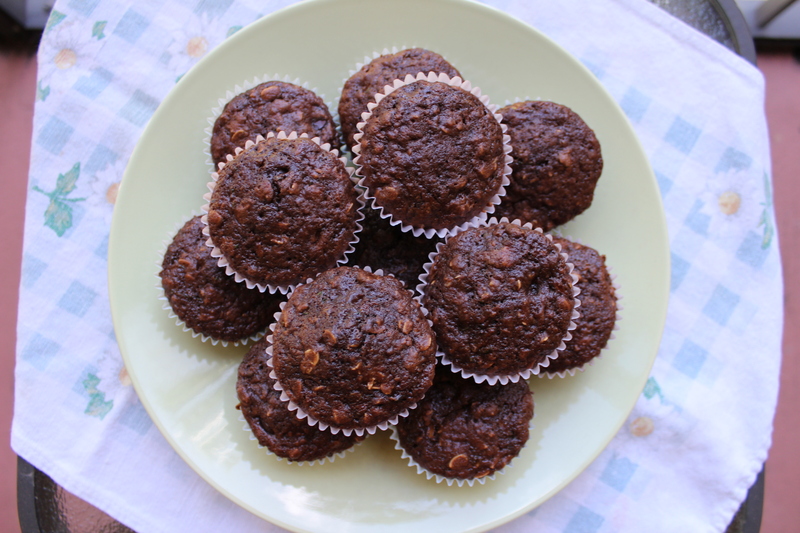 Recipe: Chocolate Zucchini Muffins | Finding delight. I’ve been craving decadent dark chocolate desserts as of late. So, the other day, with an hour to spare in the late afternoon, and a rogue zucchini needing to be used in the name of pre-hurricane food clear-out, I baked up a batch of these chocolate zucchini muffins. The zucchini helps the muffins achieve cake-like moistness, while the oats justify eating these bad boys as a breakfast food. Delish! This recipe is a great one to have in your wheelhouse. I love that it utilizes pantry staples I pretty much always have on hand. Then, you can customize based on what else is lying around/your tastes. Just switch out the cup of grated zucchini for any other moist addition (Think: over-ripe bananas, applesauce, canned pumpkin, mashed sweet potato, grated yellow squash, etc). Switch out dark chocolate morsels for any other mix-ins (Think: chopped walnuts or pecans, raisins, dried cranberries, white chocolate chips, etc). And switch out cinnamon for any other spice! Pro-tip: Homemade muffins make a lovely gift. Just package in a box, tie it up with some twine or ribbon, and add a tag. Affordable and adorable!! – Preheat your oven to 350 degrees Fahrenheit. – Grate one cup of zucchini. – Line muffin tin (recipe makes 12 muffins) with muffin cups. – Measure your dry ingredients into a bowl and stir to combine. – Mix your yogurt, zucchini, and eggs into a separate bowl. Then, add dry ingredients to wet and mix until batter consistency is achieved. Add dark chocolate morsels and stir once or twice. – Fill each muffin cup about 3/4 of the way full with batter. – Allow your muffins to cool for about 20 minutes and then ENJOY! Pingback: Giveaway: Spring Fling! | Finding delight.